● See the Promotions page for short-term sales and price reductions. On this page you’ll find gifts priced £15 and under, £30 and under, and £50 and under, as well as featured items offered at deep discount. ● Tooled Up holds regular prize giveaways and competitions. Recent prizes include brand name multi-tools and accessories and a compact fret saw. In order to enter for prize drawings, you need to submit your email address and birthday, which will also qualify you for personalized birthday coupons and vouchers. ● Low stock items sold at a reduced price are collected on the sale page. Discounts on clearance items vary significantly, but you can limit your search to items in your price range by using the price filter on the top right of the page. Clearance items are available under £20, between £20-50, and up. ● Tooled Up appears to frequently offers coupons. These include regular monthly coupons for £5 off orders of £50 or more, as well as price reductions on featured items and discounts of up to 10% off sitewide. 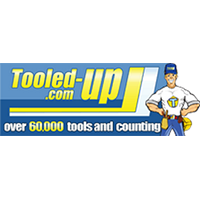 Tooled Up offers a full range of tools for inside the house and the garden. Users can choose to shop by brand by clicking on the bottom of the landing page. Or they can use the links at the left hand side of the page. They can shop by tool by clicking on the banner in the middle of the landing page. Technical help is available at the bottom of the landing page by clicking on the “technical help” link. This UK company also offers locks and security devices. There is a phone number to call with any questions. For most up to date offers check out Tooled Up on Facebook and Twitter or contact Tooled Up Support for any questions.